LG Electronics announced Monday it is embarking on a research and development plan for the sixth generation of the telecommunications network beyond the upcoming fifth generation in order to lead the future market. 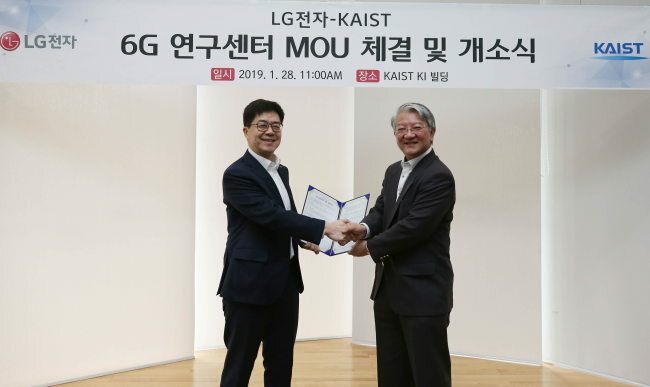 LG opened a 6G research center within KAIST Institute, a research organization for technologies for the country’s economic development run by the Korea Advanced Institute of Technology in Daejeon Metropolitan City, which will be headed by Cho Dong-ho, professor of electrical engineering at KAIST. The institute and LG will conduct joint projects on new technologies that connect 5G and 6G in a bid to move faster than competitors into the 6G market. “LG will enhance research on telecom network technologies to be able to lead global standardizations for the sixth-generation network,” said Park Il-pyung, chief technology officer of LG. LG was a leader in the commercialization of the fourth-generation Long Term Evolution network. The company topped the number of patents on LTE and LTE-Advanced technologies from 2012 through 2016, according to market researcher TechIPM. LG Uplus, the telecom affiliate of LG Electronics, launched the 4G mobile services ahead of bigger players SK Telecom and KT in 2011. On the 5G network, LG has been focusing particularly on automotive communications technologies by teaming up with Qualcomm to develop Cellular Vehicle-to-Everything technologies, known as C-V2X, which will help deliver data at the speeds necessary in a real life driving situation. LG was the world’s first to suggest the global standards for the 5G-based automotive telecom technologies, it said.